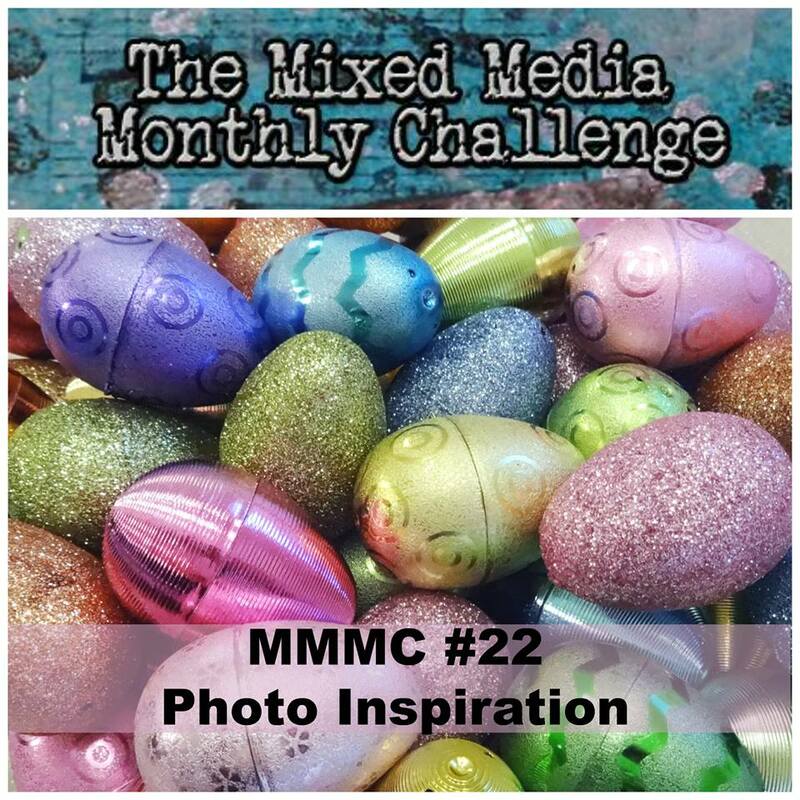 Creative Juice: The Mixed Media Monthly March Challenge! Whatever this photo inspires you to create, go for it and share it with us! It could be the colors, textures, shapes, theme… got the picture? (ha ha) For my take, I created an Easter decoration. I've had a vintage milk glass dish in my stash for a few years. It's the bottom to one of those chicken-lidded dishes that I found at a garage sale. I knew it would come in handy one of these days! To make my chocolate bunny, I diecut five bunnies out of matboard and glued them together to make it nice and thick. Who wants a skimpy chocolate rabbit? Next I "iced" it with Ranger's Texture paste over both sides and the edges so it was all covered. (Forgot to take a photo of that step, oops!) When it was dry I spritzed it with Ground Espresso Spray Distress Stain to make it a chocolaty brown. 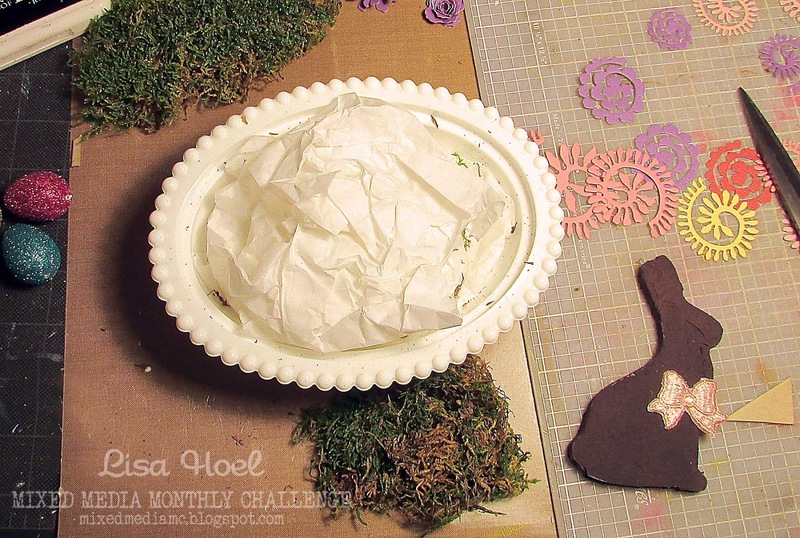 To create the base I glued in some wadded up tissue paper. A chunk of florists' foam would have been perfect too but I made do with what I had. I hot glued sheet moss over the top. To make the bunny easy to attach, I inserted some needles into the base between the middle layers of matboard. It poked right into the base! The fun part was arranging the glittered eggs (crafts store plastic quail eggs covered with glue and then glitter) and flowers around the bunny. 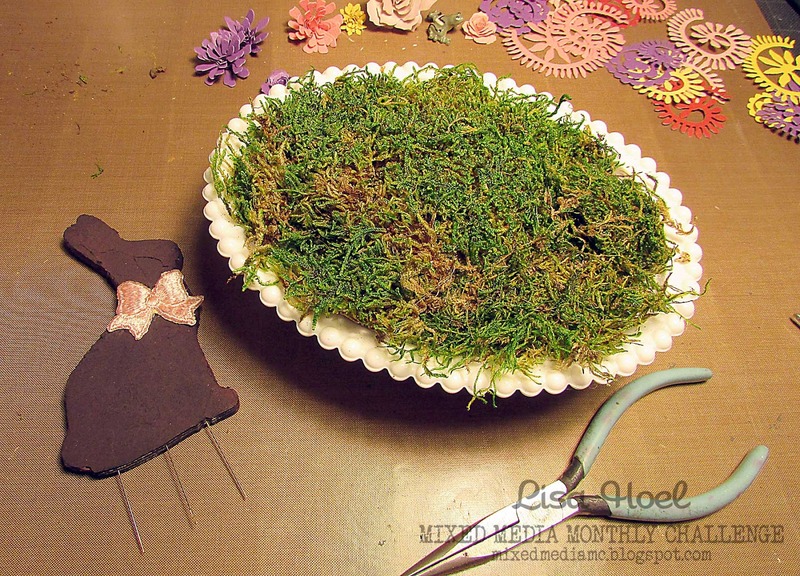 We hope to see you share your inspired projects with us! (Link up HERE.) 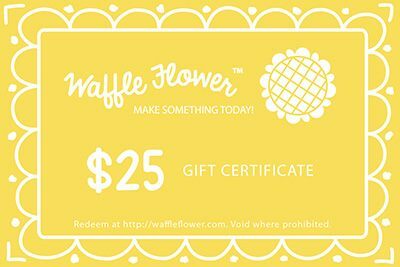 Join in and you'll have a chance to win a $25 gift certificate to spend at Waffle Flower! Many thanks to them for being our sponsor for this month's challenge. This is so cute. I love how you used the base, so clever! composition and colors are beautiful! 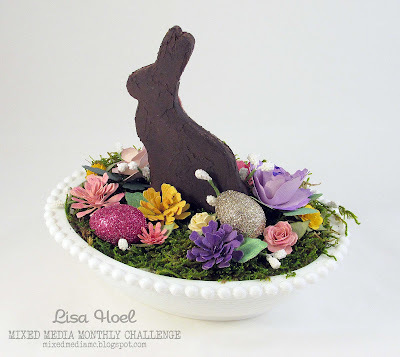 Oh, your faux chocolate bunny is just wonderful, gorgeous decoration for Easter! 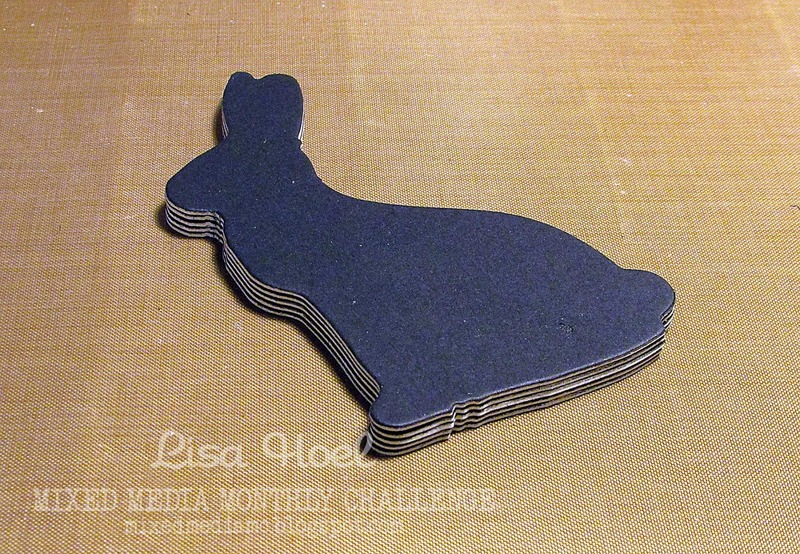 Super cute project Lisa! Your bunny looks scrumptious! Its so beautiful!!! Love the whole composition! 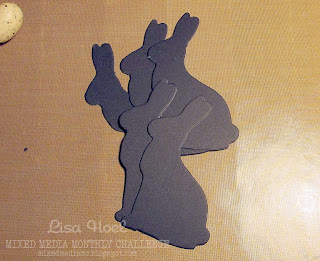 Lovely Easter decoration - what a great tip to cut several layers and glue them together! Brilliant Easter decor! He looks delicious enough to eat! that chocolate bunny looks too yummy. :). beautiful ! 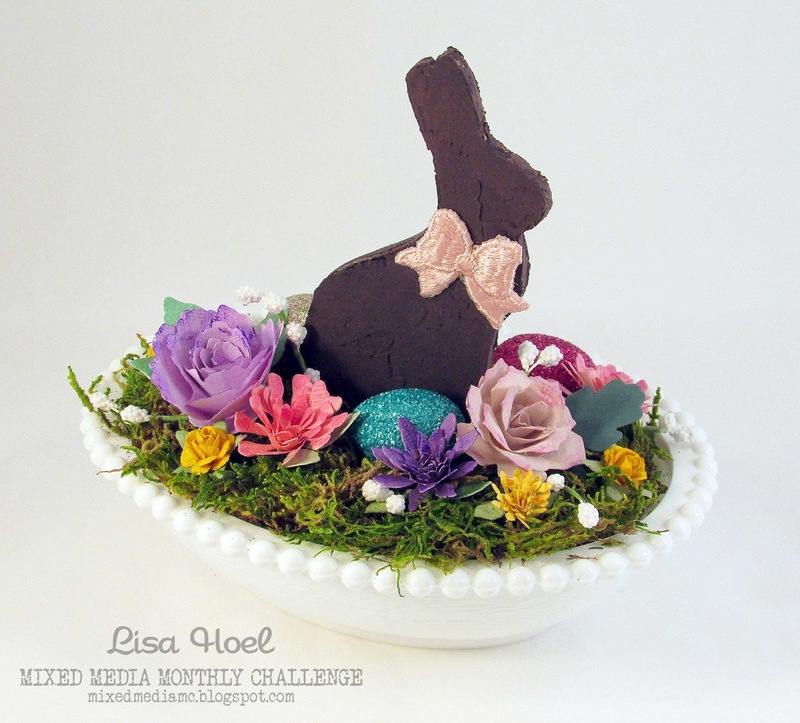 Hi Lisa,this is the most creative Easter artwork I have ever seen. The bunny is so cute and so are the mini garden and the eggs. Thanks for the great inspirations.